The Casio TR-18BK black thermal ink ribbon cartridge is designed as a replacement ribbon for Casio's CW-50 and CW-75 CD Title Writers. Combined with Casio's color thermal print system, you can produce unique, professional-looking custom graphics and text, printed directly onto your CDs and DVDs without the necessity for labels and applicators. Each TR-18BK thermal transfer ribbon will print about 50 CDs using one print area at up to 200 dots-per-inch resolution. Black Ink Ribbon Cassette is rated 4.7 out of 5 by 9. Rated 4 out of 5 by Anonymous from I only wish the ribbon was much longer It seems as if these units' closest competitor is the Signature Z1 so I will compare this cartridge to the Signature. So far we've had no defective Casio cartridges - we always used to have one or two defective Signature carts every so often. 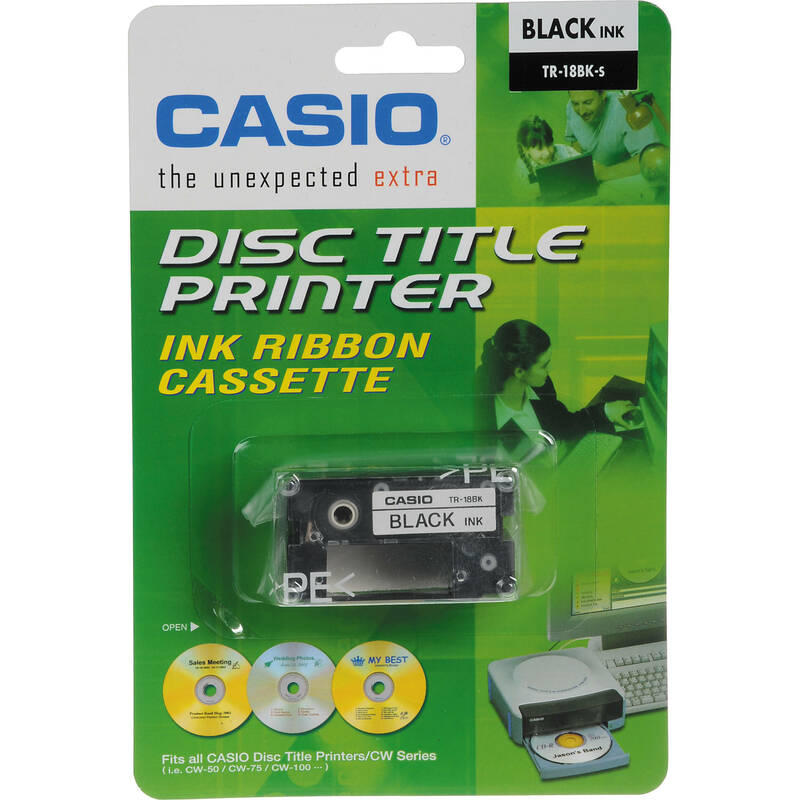 The Casio carts are designed in such a way that the printer can detect when the ribbon is almost finished and warn you to replace the cart, eliminating the annoying wasted discs that the Signature produced. My only wish is that the cartridges lasted longer. I think the price is appropriate; I'd be happy to pay double the price for a cart that lasted at least twice as long. It's just that replacing the cart once or twice during a single project gets annoying. Rated 5 out of 5 by blessedahf from I'm gonna continue to buy this product!! The ink I bought works great. I even got more life out of one of the cartridges than its supposed to give. We are always needing ink, so this will definitely be our supplier. Great pricing too!! Rated 5 out of 5 by Anonymous from This ia great product The product is great, and the cost is even better. I have been looking for a long time. Thanks for the product. Rated 5 out of 5 by dave423 from Graet Deal I was unable to find this anywheres except at B&H. The shipping was fast on top of that! Rated 5 out of 5 by Anonymous from Casio ribbons never fail Just like blue, red and green the black casio ribbon never fails to work on discs. Rated 5 out of 5 by Kansasgirl from Awsome deal Awsome as all my other deals on items. Rated 4 out of 5 by Anonymous from Great Customer Service Everything is awesome!